You may be throwing a large sum of money in the trash every month. Did you know that your heating and cooling system is the single largest consumer of energy in your home. Doesn't it stand to reason that it should be well engineered. How can it be when it is built on the fly when the installation crew with the lowest bid shows up on the construction site well after construction of the house has already commenced. However chances are this is how your heating system was built or will be installed into your new dream home. Why is such a critical step ignored? There are a number of reasons. With the new wave of public concern about indoor air quality ,the environment and rising energy costs this is certain to change. There will however be costs attached to this change. The builders and the public at large will need to adjust the rising cost of new technology and new techniques that go along with it. I plan to describe the steps that are necessary to design your heating and cooling system to achieve the following criteria. Comfortable, Healthy, cost effective, efficient and quiet. I have recieved a request from potential customer for a quote through email. I am posting a response to that inquiry because I feel that it describes what this page will be about. A visitor to www.thermostatmechanical.com has sent a message through your contact form. Question/comment: I'm interested in a quote to replace my 20 year old gas/central a.c. with an electric back up heat pump. Location is Columbus, IN. Thank you for your interest. I hope I can be of some assistance. I would need considerable more information to give you an accurate estimate. In order to deliver a system that will last and will perform at the manufacturers stated efficiency rating a number of steps need to be performed. Allow me to change the subject for a moment. I just wanted to say that my web site is new and I intend to put a lot of the information that I am about to tell you on my web site. The first topic is what size equipment and SEER rating will give you the best return on your investment. I think that this is the way that we retrain ourselves to approach a change out or a new installation. Believe it or not this is not a common practice. Most contractors use simple rule of thumb methods such as square footage times some magic number to determine what size the equipment should be or even worse they may just size a replacement piece of equipment based on the existing equipment size. There is also the topic of duct work. I will attempt to explain these topics in as a condensed manner possible however there is a lot of material to cover. You may ask yourself why not install a unit that you know is big enough that it will never be too small. Sadly a lot of contractors take this approach. There are a number of reasons not to do this. A unit which is too large will short cycle and will consume way more power than it needs to. Short cycling will also shorten the equipments life span as well as require a lot more repairs through out it's shortened life. An air conditioner that is too large will not dehumidify properly. Equipment that is too large by all rights will need larger duct work. Larger duct work in unconditioned spaces equate to more heat gain and loss. It is a vicious cycle. If the equipment is to large for it's duct work the equipment will over heat and shorten it's life. The air distribution system will also be louder than a properly designed one.If any of these factors are ignored you will not receive the efficiency which you have been promised. Unfortunately, it is a common practice to install duct work that is too small. This is because most contractors again, are using simple rules of thumb and want to minimize the amount of material that they use. Duct design is actually very complicated and misunderstood by most contractors or their employees. Sadly a lot of companies make more money by their mistakes. Ignorance is bliss. Mr CEO hires low to mid skilled installers and technicians which do not demand high pay who install equipment incorrectly which in turn breaks down on a regular basis. The company sends out a technician who probably never looks beyond the box and who probably doesn't understand air distribution. He may never even check to see if the unit is over heating. He will probably just replace the broken part without determining why the part failed in the first place. You also develop a nice relationship with that company because you have to call them on a regular basis to repair your equipment. This builds recognition for that company. This really isn't his fault either. Whether the employee is an installer or a service technician he will be rewarded for the speed or the number of calls he can complete in a given amount of time not on the quality of his work. That is the nature of the top down run heating and cooling business. The secret is out, or is it a secret if they don't even know that they are doing it? Because I worked my way up and I am a one man company I think of my company as bottom up run company. It isn't a very profitable way to run a business but it is the only way to assure honesty and quality. By installing properly sized equipment and duct work the equipment does not require as much attention and the customer may even forget about me. Most people would assume that having the heating cooling system replaced should be like having their hot water heater replaced; this simply isn't true as you can see. After determining the heat gain and loss of the structure we can then determine what size equipment will be necessary to meet that load. Once we know what size is necessary we can compare different brands and efficiency ratings against their initial cost in order to predict their return on investment.As part of this analysis I can predict roughly what the energy consumption in dollars will be for any given piece of equipment. I have thousands of dollars of software to help with all this. Even with the software it is a tedious and lengthy process as you will see. Let's determine what size equipment is necessary. The only way that should be done is what is known as load calculation. This requires entering information about your home into a set of calculations or a computer program such as the one that I use. This information includes r-values of insulation used in your home, all materials and dimensions of all exterior surfaces and their orientation to the Sun. Such as information about the type of window and it's properties as well as if shades are used, screens or storm windows, overhangs and even ground cover outside a window which affects reflected light into a window. Also heat conductivity and the solar heat gain coefficient of the window if available. I gave you a lengthy example about windows just to give you a sense of the complexity of the data which a good load calculation requires. Some other information the load calculation requires are things like duct work surface area in unconditioned spaces, infiltration, sensible and latent heat gains from equipment,appliances and people etc.. This will require very detailed drawings of the structure and/or a visit to the house. Depending on the size and complexity of the house it can take 3 to 6 hours to gather the necessary information to enter into the load calculation. It can then take an hour or two to gather information on the existing duct work. This is why I am not able to give free estimates. If a company is willing to give you a free estimate especially over the phone or email alone without gathering this data, I would tend to be very skeptical of that company. They know not what they do. They only know that it works for them. I wish that there was a license requirement to perform this type of work throughout Indiana, Sadly I know of only one county that requires contractors be licensed and that is Brown county. I do not have that license because I have not been asked to work in Brown county as of yet. I do not know about Bartholomew county. I will need to find out. This may have been more information than you were looking for. You may have wanted just a price so that you can shop for the best price. So here it goes. My competitors charge anywhere from $4000 - $6000 for an average change out Without doing any real planning. My estimate will require going through all the proper steps and can take from 4 to 8 hours at your home with a 2-4 additional hours in my office to analyze the information to maximize your return on your investment. At my current service rate this would cost between $400 - $800. I would also need a $30 trip fee. I charge $15 per county trip fee. Vans get 10 miles to the gallon and have a lot of upkeep. This all sounds expensive but could pay back in high dividends when you see what you can save on your utilities with a well designed system and not your typical change-out. I won't up sell you just to make a fast buck. I find in some cases a unit with a quoted higher SEER rating will not pay back the extra investment to make it worth the extra investment with the use of my energy audit software. You may find that you lose hundreds if not thousands of dollars a year through a poorly designed and or executed heating and cooling system. If I have an even playing field I am less expensive than my competitors. If I can just walk in and do the same thing they do which is to pull out the old equipment and stick new entry level equipment in I will be $800 - $2500 cheaper. With doing the right thing and taking the time to properly size and design a system and executing the installation my pricing will fall between the lowest bid and the middle of the road. I hope this helps you. I just wish I could get this down on my web site the way I want it to be. It doesn't help that I can't get to work on it until midnight. Well it's about 1 a.m. so I'm going to say good night. Click on the Thermostat to contact me. 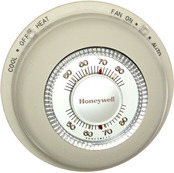 Thermostat Mechanical. All rights reserved.